For the first few days after your brace has been fitted, your teeth may be tender, especially when any pressure is applied to the teeth. This is normal and will get better soon, usually within 7 days. Simple painkillers (e.g. Ibuprofen can help with this). The brace may rub initially against your soft tissues (lips and cheeks) and cause ulcers that should last no longer than around 2 weeks. Warm salty mouthrinses can help ease any discomfort and you can use relief wax or silicone on your brace to help cushion your mouth from the rubbing. Your mouth will eventually get used to this. The most important thing is to keep your teeth, gums and brace perfectly clean using your toothbrush and a fluoride toothpaste. You should brush your teeth 2-3 times a day, and for at least 3 minutes each time. Your teeth and gums will be damaged if you do not keep them clean and your treatment may be stopped early if you are not able to maintain an excellent level of oral hygiene. You will have been shown how to brush your teeth properly by the orthodontist or nurse - it is important to remember to brush well along the outer surfaces of your teeth with a regular toothbrush, as well as in between your braces with the smaller, inter-dental brushes in your starter pack. Don't forget to use a fluoride mouthwash daily. Remember that permanent markings (decalcification) on the teeth can occur if you consume foods or drinks containing excessive sugar and/or acid (eg, sweets, fizzy drinks, diluting juice, etc). This tooth scarring also can occur if you do not brush your teeth frequently and properly. Treat your brace with care - avoid hard or sticky foods e.g. toffee or chewing gum. Foods like these cause breakages of the brace - breakages mean additional visits, which will lengthen your treatment time overall. Foods like apples, French bread and crispy-based pizza should be cut up before eating them or avoided completely. 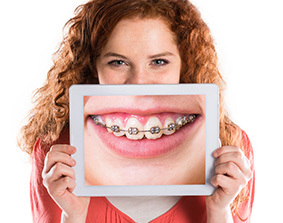 You should attend the clinic on a regular basis to have your brace adjusted. You should also continue to visit your own dentist for regular check-ups throughout your treatment. Occasionally, there may be minor problems with your brace. Please telephone the practice on 01224 611633 for advice. If there is no-one there to take your call, you will be asked to leave a message (messages are checked regularly) and we will return your call as soon as possible. If part of the brace feels sharp then you should use the relief wax or silicone provided. Should this not solve the problem, please telephone the practice for advice. Sometimes a little bit of wire is exposed during treatment and this may need to be trimmed. Don't panic if a piece of the brace breaks - it is seldom an emergency (unless there has been trauma to the face or teeth, resulting in an injury causing pain, swelling or bleeding). 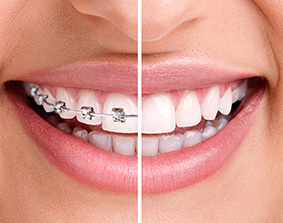 Lost brackets, ligatures or elastics do not need to be treated as an emergency and if you are not in any pain or discomfort, you will be appointed within a reasonable time, convenient to our daily schedule.